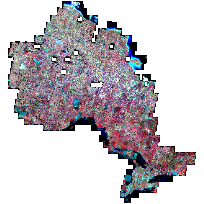 This data set consists of SPOT 4/5 imagery, which was acquired and orthorectified for the entire country by Natural Resources Canada (NRCAN) within a National SPOT orthoimage project between May 2005 and October 2010. The province of Ontario was a partner in this project. The original imagery was acquired and processed to have a ground sample distance (GSD or pixel spacing) of 10 metres for a panchromatic band and 20 metres for three multispectral bands. MNR has pan-sharpened and enhanced the images covering Ontario, to form a set of 10 metre multispectral (infra-red, red and green) images. This set of images is available as geo-referenced TIFF and/or JPEG2000 files. Each band has a radiometry of 8 bits (values between 0 and 255). The multispectral image provides four bands. The minimum cloud-free (2% maximum) coverage required for an image (selected zone) is 40 km x 40 km, panchromatic and multispectral taken simultaneously. Spatial data is expressed according to Universal Transverse Mercator projection, in reference to the North American Datum 1983 - Canadian Spatial Reference System (NAD83CSRS). Satellite imagery provides a point in time reflection of ground conditions and is used as a source of geospatial information. Government of Canada, Natural Resources Canada, Centre for Topographic Information - Sherbrooke (CTI-S): Geobase Orthoimage 2005-2010 (SPOT): The SPOT imagery was provided by NRCAN. GeoBase Orthoimage 2005-2010 is made from SPOT 4/5 earth observation data covering Canada's landmass south of the 81st parallel during the period 2005-2010. Each GeoBase Orthoimage 2005-2010 covers an area of approximately 3 600 km2, or 60 km x 60 km of the Earth's surface.Orthoimages have a resolution of 10 metres for the panchromatic band and 20 metres for the multispectral bands. The panchromatic and multispectral bands are aligned. If the resolution of the source image is better than the requested 10 metres or 20 metres and the images are resampled at 10 and 20 metres, the original source images are provided for quality control purposes. The radiometric information from the resulting image matches the information from the original higher-resolution image as closely as possible. Each band has a radiometry of 8 bits (values between 0 and 255). The multispectral image provides four bands. The minimum cloud-free (2% maximum) coverage required for an image (selected zone) is 40 km x 40 km, panchromatic and multispectral taken simultaneously.Spatial data is expressed according to Canada Lambert Conformal Conic projection or Universal Transverse Mercator projection, both in reference to the North American Datum 1983 - Canadian Spatial Reference System (NAD83CSRS).